To help us connect with Angels our abundant earth has given us the most beautiful Angel crystals. Millions of years before life emerged on earth, lakes of fire began to cool to form the very first rocks, minerals, and crystals. The oldest crystal found is 4.4 billion years old. Every variety of crystal grows according to its own highly ordered, repeating pattern. Hence an amethyst crystal will be distinct from an emerald crystal not only by colour but also by the microscopic arrangement of atoms inside it. This gives each variety of crystal a completely individual, geometric, crystal structure; its crystalline fingerprint, or personality if you like. A crystal, like all matter, is formed by vibration, and that vibration expresses itself in a corresponding geometrical shape, called a crystal structure. The formation of the geometrical shape makes a crystal useful mainly because its structure has frequency stability. Frequency stability means that crystals emit the most stable and orderly frequencies that exist on earth. So stable and reliable is the vibration or frequency of crystals that they can be used to raise our personal vibrations, and also to bring irregular or disordered vibrations into harmony and restore optimum health. This is why crystals and their unique powers of healing, regenerating and harmonising have been used for thousands of years, and why our advanced technology of today would not work at all without these awesome miracles of our planet earth. Crystals can be of great assistance in establishing Angelic contact. because Angels and crystals are very closely linked. These ‘Angel Stones’ I list below are highly spiritual stones that possess metaphysical properties which can raise ones vibrational frequency, making it easier to establish communication with the Angelic realms. These magnificent gems can all be used to enhance our experience of the divine, to elevate us and help us fly and soar on our ascension path. These astro-magical, mystical masterpieces of nature are the Angel’s gifts to us. Open up your heart to them and they will respond. with love. Crystals are your friend and just like the Angels they are here to help you. They are one of the most powerful tools available to us in the physical dimension. Today we are looking at three of my favourite Angel crystals, and ones I use often in my Angel Jewellery. Angel Aura Crystal, Angelite and Seraphinite. Angel Aura Quartz Crystals are created by bonding a natural quartz crystal with a precious metal infusion of silver, platinum and other trace metals which give them the shimmering colours of gossamer angel wings. Molecules of platinum and silver adhere to the electromagnetic charge which surrounds the quartz crystal, combining these to produce a stone of intense radiance and uplifting spiritual energy which opens us up to divine angel guidance, protection and deep states of meditative awareness. Seraphinite is a lovely dark green stone that has chatoyancy, an optical reflectance effect seen in certain gemstones such as Moonstone and Tigers Eye. The changes in sparkle and light are how it acquired its name, due to its resemblance to the feathered wings of an Angel. 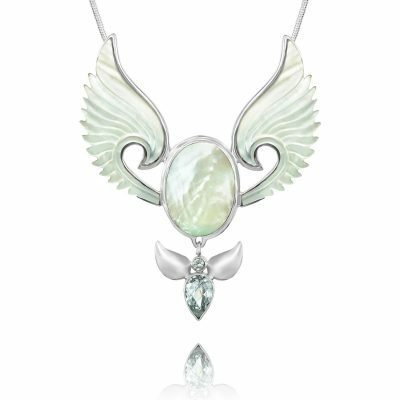 This angelic gemstone activates the spinal chord and links to the Aura. It is said to be among the most important stones for connecting and communicating with higher energies, especially Angels. Seraphinite is mined in a limited area of eastern Siberia in Russia. The word “Seraph” is from the Hebrew Testament, and refers to winged angelic beings in service of God. Angelite is a beautiful opaque, powder blue and white crystal, sometimes containing flecks of red. 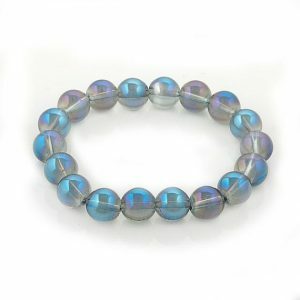 It is formed from Celestite that has been compressed over millions of years. 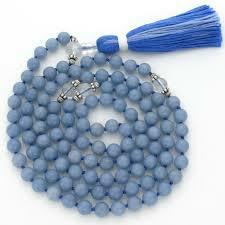 Angelite dispels fear and brings peace to the wearer. It is used to unblock energy pathways and benefits the throat, the third eye and the crown Chakra, making it a splendid choice for communication with the Angels. Use any one or all three of these stones in meditation, and to intensify Angelic communication. Keep the intent to seek angelic contact placed firmly at the forefront of your mind. 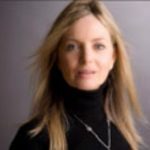 If you desire to connect with a particular angel, such as your guardian angel or an Archangel such as Michael, Gabriel or Raphael, include their name in your intention. Ps. More about Angels in these articles below. Words from Linda, about her Angel Jewellery. 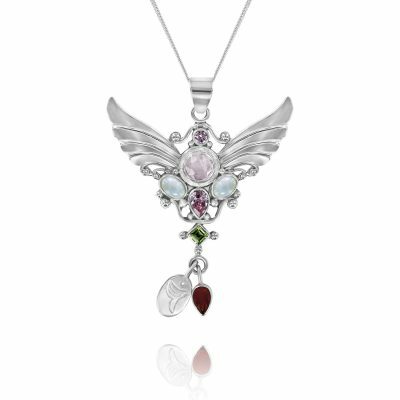 Check out these Angel and Archangel necklaces in the photos below – they are my most popular ones and are helping so many people, as you will read in the testimonials.